It would be nice to have a free, lightweight, platform independent, user friendly, powerful CAD software that works for everything. Unfortunately most CAD packages only deliver on a few of these criterion. In an attempt to broaden my knowledge, and to find out what is out there I started looking at a variety of 3d modeling and design software. This post is only one in a series and is intended to give my initial reaction when researching, downloading, installing, and the first use of each. For a compiled list of reviewed software check the overview post. Right off the bat I like Shape for one reason, it’s free. As a part of the Dassault Systemes family 3dvia is an attempt to get 3D everywhere. Bernard Charles, the CEO of Dassult, has openly admitted he is making a billion dollar bet with the company generally surrounding the “server in the cloud” approach to 3D modeling. Though Shape is not nearly as powerful as some of the other Dassault offerings it was one of the first to pioneer this crowd sourcing approach with a directly built in option to publish models to the 3Dvia.com website. So how useful is this software? It really depends on what needs to be designed. For production manufacturing Shape is not going to cut it, but to develop some ideas, or teach a new user the basics of modeling in 3D it may serve a purpose. Coming from a background with parametric, or history based, CAD programs Shape is a whole new beast. This can be both good and bad. 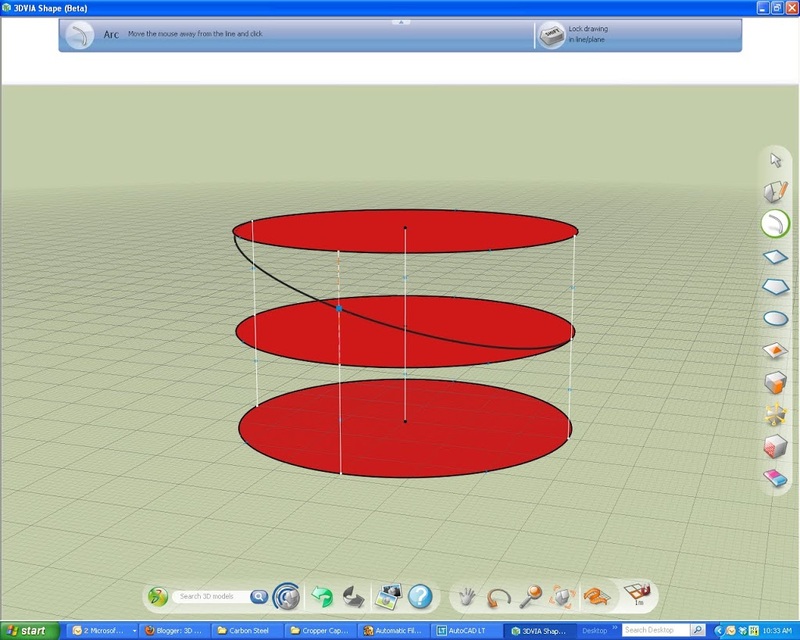 3dVia Shape can be downloaded and installed fairly quickly. The installer is just the first download, more files are downloaded once the installer is run but in contrast to some other software installs (I’m looking at you Solidworks) this is a very quick process. For me, clocking around 1.2Mb/s download, I was able to be up and running with 3dVia Shape about 15 minutes after I initially clicked the download button. The requirements for it are also less than many other higher end software. 3DEngr: Who is Shape designed for, Students/Professionals/Hobbysits? Cliff: All three. And, we could include gamers, and K-12 students as well. Anyone creating 3D models. 3DEngr: In your opinion how does Shape stack up against other CAD packages in terms of Price vs. Functionality? Cliff: 3DVIA Shape was never meant to be a CAD tool, but a conceptual or quick modeling tool. CAD tools include functionality to bring a design to production, where Shape was not designed for this purpose. 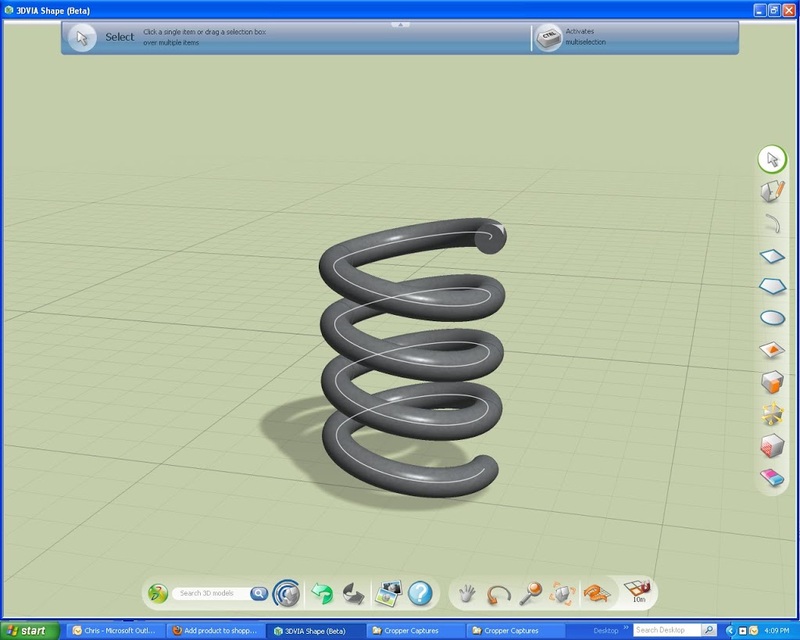 The advantage of 3DVIA Shape over other CAD tools is the ability to create something very quick, that I can immediately be shared on 3dvia.com. For example, let’s say I just envisioned a new children’s toy design, and I want to share the idea (that is currently only in my head) to someone quick. I would not want to build this model in a CAD package, as it would take too long. I can use the simple features in Shape to design the toy (not to any specifications). I would publish the toy design to 3dvia.com, and send the link to others, who could view it in 3D on any computer with internet. If I wanted to eventually produce the toy design, I could add detail in within a CAD application, like SolidWorks. 3DEngr: Shape seems to require a unique approach to building models, specifically compared to history based modeling. When first learning shape did it take long to transition your modeling techniques? Cliff: 3DVIA Shape is actually built by the same people who designed CATIA, the PLM 3D modeling tool used by the top automotive and aircraft companies worldwide, so we have some of the best 3D modeling designers working on 3DVIA Shape. I could reiterate from my last statement about how easily children can learn 3DVIA Shape. It’s a great application for those new to 3D. 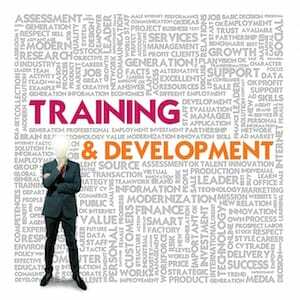 3DEngr: How did you learn, what helped you learn shape? Cliff: I have used so many 3D packages over my career, so Shape was very easy to pick up, it really is very intuitive. 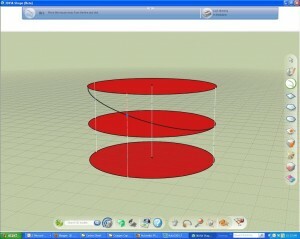 We have plenty of learning materials on our video and tutorial channel: www.3dvia.tv to teach those new to Shape. Cliff: Exactly, I can build models so quickly using 3DVIA Shape, that’s why I use it most. It would take much more time to design any object in other CAD packages. If the object I was creating was very detailed or I needed precise tolerances, I would use SolidWorks. 3DEngr: Where are the limitations in your eyes, What items will you NOT use Shape for? Cliff: If I was eventually going to build a physical prototype or if I needed a highly detailed 3D model, I would not use 3DVIA Shape, it was not built for that. It may be a good first concept, but not the final product. One more advantage I wanted to mention about 3DVIA Shape: There is a lot of talk about “the cloud” in design. 3dvia.com is closer than most companies to using the cloud, as we have proven that users can collaborate on their designs, and keep their designs online, and not on their desktop. Every 3D model I have created using 3DVIA shape is located on the 3dvia.com server. I can access the model from any computer, by just logging in to 3dvia.com. I believe this is the future of 3D design, and 3DVIA is already there. One other note I wanted to make: 3dvia.com is useful to anyone who creates 3D models, whether it is a manufacturing engineer, a 3D artist, designer, etc. We accept 3D models of most formats. You can store any 3D model on 3dvia.com, and share easily with others, who can view them in 3D using our 3DVIA player – our lightweight FREE plugin. It’s a great way to share and collaborate any 3D creation. 3DEngr: Thanks for taking the time to answer these questions Cliff. As he said all of Cliff’s models can be found here on the 3dVia library. This is one of those areas where Shape shines. Because it is a free platform there is no reason to package tutorials in the software and slow things down, rather they are posted online. Hosting videos on the 3dVia site serves a dual function. First it is a great reference for learning the software, the tips and tricks of 3dVia offer a sampling of the functionality and provide examples for the workflow required to get specific shapes. Second, it serves as a great marketing tool when items like the car model are shown. More Shape training Videos can be found on Youtube. The biggest trick to Shape, and the reason I think it Shape should be introduced to a younger audience , is knowing geometry. Without any real dimensioning tools available to lock in lengths or arcs or lines it is important to have a way to define each segment. 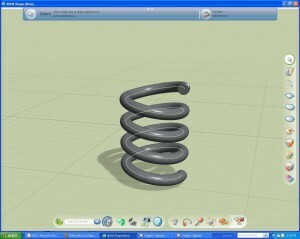 For example, an earlier post too a look at spirals in Solidworks. The key was that the system was able to define a spiral for me, but the thought process that went into defining a spiral was more “what can this feature do” rather than “what actually is a spiral”. With this in mind it took a few minutes to come up with a way to create a spiral in Shape. Here are three equal circles on 3 planes. By first sketching a few line segments and using the midpoints the planes were created equi-distance apart. 3dVia has a nice set of snap to features that allowed me to make perpendicular and equal segments. The mid plane circle came next and then few more line segments to attach all three. Lastly an arc which requires 3 points and would function as the helix. By snapping to the vertex opposing sides of two planes I had the basic path but the 3rd point was the key to all this hassle. Here I snapped to the midpoint of the other segment that stretched between my first two planes. Creating a profile at one end of this helix allowed me to use the push/pull feature along the path. There were some issues getting the profile to essentially “sweep” along the path likely because the profile created was not actually on the path initially. This is where the ability to insert standard planes and references would come in handy. After copy/pasting this segment a few times to create a coil from one revolution something was wrong. The tangency of the start and end points meant the curve was not creating a helix. When the profile swept along the path it started out a little bit too tangent and the finishing tangent was not the same. Copying the component using the mirror flip further enhanced the non smooth surface. This can be overcome by trimming the start and end portion or further reducing the segment to a working portion or by creating an entire helix, which is next on the list of things to try. Alt key- I hate that every CAD tool uses a different functionality to rotate around 3d space. At first I thought it was necessary to actually click the rotate tool in shape but the Alt key works as well. It’s annoying that complete pan/zoom/rotate can’t be done with a mouse though because it means two hands are used. How am I supposed to eat a sandwich and admire my cool models if I need a second hand. Copy Paste/Space Bar and Shift – Hitting shift during copy paste of model items maintains orientation. Space bar allows the point of insertion to be changed. Both are shown in the handy help menu that is always aparent at the top of the screen. Shape is not without it’s bugs either, and one of them was apparent in my first modeling attempt. When opening Shape it requires that you sign in to the server. It seems that the server will however log a user out after a set time. So if you take a while to create a model and then try to upload it there is a server error. A google search turned up a forum post which had a workaround to saving but not knowing that my files are always secure is quite a concern. That being said, while modeling a second item the software completely froze again (to their credit I’m not running on the greatest system, granted I am above the recommended mins but I also was running 2 and sometimes 3 CAD programs as well as a few other things while working in shape). This time however my model was maintained, it seems a local copy was kept or somehow stored away. Akin to the new “cloud” version of things previewed at Solidworks World this year, my model was given back to me in exactly the state it was when the freeze occurred. Next up was something work related. The lack of true dimensioning is a fatal flaw, meaning Shape will never make it’s way into our production drawings but for showing off an idea or two it could be useful. Actually, the lack of history makes it an ideal candidate for throwing together ideas. Pushing and pulling surfaces without having to worry about slow rebuilds and lots of errors, that is something worth hanging around for. This is the model of a basic pressure vessel, again no engineering principles are applied here but as a representation of the vessel it does an alright job. Last was something more fun. Without any children toy ideas on hand the next best item was one that contained slightly more geometry and is easily recognizable. Still a small and basic model this iPhone model helped to gain some familiarity with the tools used in Shape. Shape has its limitations, and did not run flawlessly on my system, but when it comes to easy to understand programs it delivers. Most of my modeling will continue to be done in other programs but the ease of working in shape and the quickness of download make it a good option if I ever am on another system and want to quickly express an idea.